This was my introduction to Ruth J. Hartman's work, and it certainly will not be my last! This was one of those novels that drew me in, and one that I definitely had a hard time putting down! Out of all the characters introduced to us in this novel, I think Anne was my favorite. She was so completely relate-able that sometimes felt that I was reading a novel about a woman that I could have been (had I been living in that time period). All of the characters are well developed, the story-line flows smoothly (and contains all of the right elements for a good novel; romance, deceit, etc). 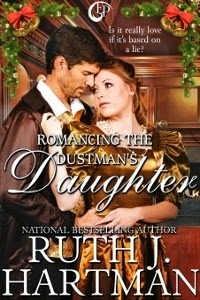 Ruth has a way with words that allows her readers to feel as though they have been transported directly into the novel. We can see what the characters see, we can feel the emotions they are experiencing. It is romantic regency at its best! DISCLAIMER: I received a complimentary copy of this novel in return for my honest review. This does not in any way reflect upon my review. All thoughts/opinions of this novel are 100% my own.